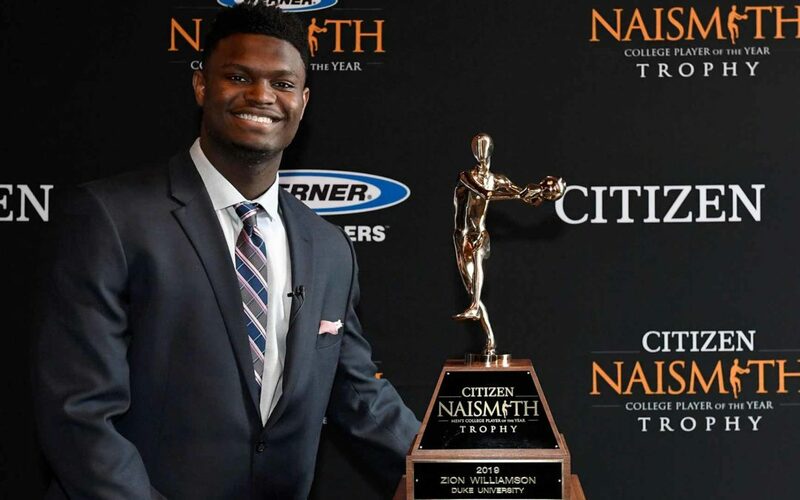 ATLANTA (April 7, 2019) – Duke’s Zion Williamson was named the 2019 Citizen Naismith Trophy winner as college basketball’s most outstanding player, announced today by the Atlanta Tipoff Club. The sensational 6’7” forward from Spartanburg, South Carolina, became just the third men’s player ever to win the award in as a freshman, joining Anthony Davis (Kentucky, 2012) and Kevin Durant (Texas, 2007). Williamson edged out three other finalists: juniors Rui Hachimura (Gonzaga) and Grant Williams (Tennessee) and sophomore Ja Morant (Murray State). The announcement and presentation of the Citizen Naismith Trophy—named after the inventor of basketball, Dr. James Naismith—was made at the Naismith Awards Brunch presented by Mortenson at the Nicollet Island Pavilion in downtown Minneapolis. Citizen, a pioneer in watchmaking and innovative technology since 1918, promotes excellence and creativity with a deep-rooted respect for craftsmanship. Citizen advocates “Better Starts Now,” searching for and accomplishing goals that are cause driven. In this respect, Citizen aligns with organizations and personalities that reflect the values of the brand including the Naismith Awards and Good360.